Greenbriar Picture Shows: Monogram's Got Game! Monogram on the March! The little company with big ideas wanted in on ticket sales that top-line theatres generated, but since when did top-line theatres want Monogram product? The company sold genre fillers, was kept in a back seat by bookers even where extra effort yielded an occasional good one. And like with mass output from all of poverty row, there were occasional good ones. What Monogram needed was known properties that came free, as in from a past century. Oliver Twist was a Dickens sweepstakes entry for 1933 (Dickie Moore in titular role, Irving Pichel as Fagin). Then came Black Beauty, and all of a sudden Monogram was getting known by parents and educators. Jane Eyre would be a most ambitious venture yet. Effort to cast Eyre became high hill for Monogram to climb, as they had no stars on contract, so would resort to free-lancers or names loaned from a major. Talk of H.B. Warner as Rochester gave way to happy substitution of Colin Clive, him of course focus of current interest (Clive makes a most congenial Rochester, not at all like moody Orson Welles or George C. Scott to come). But who to play Jane? Ultimate choice was Virginia Bruce, borrowed from Metro. She had been retired from films over a past year to nurse a broken heart, this being large emphasis from fan press less intrigued by Jane Eyre than ongoing recovery of the former Mrs. John Gilbert. Bruce is engaging as Jane and less the doormat than Joan Fontaine in Fox's hothouse remake of 1944. A few complained she was too "sophisticated" for period wear and took initiative where the book's shrinking violet would not, but what did reviewers really know of the book? Most of them, especially in trades, read nothing but trades. What Bruce had was drama built into whatever part she took, thanks to marriage cracking with mercurial Jack G., who for whatever bust there was of his career, still commanded copy for offscreen travails. The two had split, and after Bruce sacrificed emerging stardom to play dutiful wife, and bear a daughter. But it seemed there was no caging Jack, so back to pictures came Virginia, her Metro pact renewed following receipt of life's harsh lesson. Fan mags were sympathetic, Jane Eyre offering "an emotional outlet, something to fill up her days." 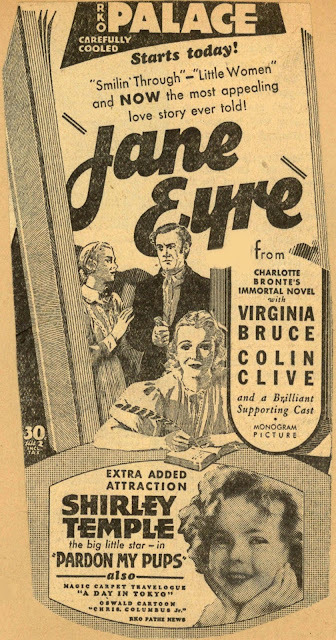 The drama, it seemed, was less Jane Eyre than Virginia Bruce. 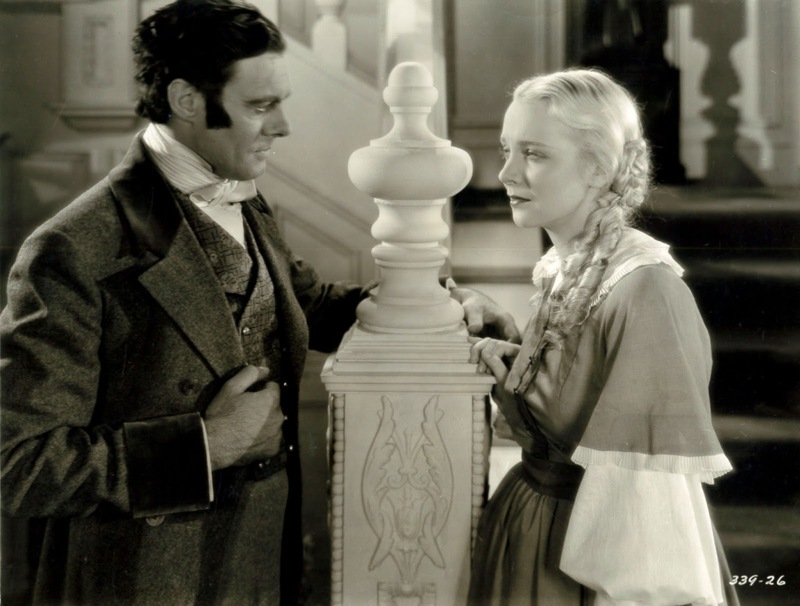 "Work --- with it she had found ... the greatest cure for heartache in the world" (Movie Classic, 7-35). Movies, it should be remembered, were about lives behind the cameras as much as ones portrayed in front of them. Certainly watchers hep to personality press saw it in those terms. 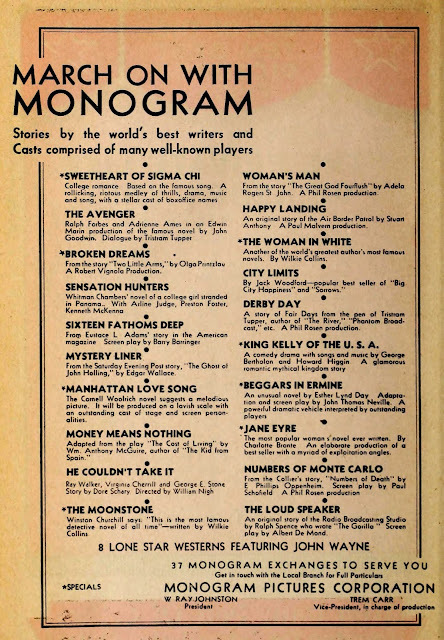 Monogram launched production on 5-15-34 with two days given to rehearsal. Yes, I said Monogram spent two days rehearsing before a shot was taken. At least that's what Film Daily reported. If someone had told Tex Ritter or Bill Cody that story a few years later, they wouldn't have believed it. Reviews might have been kinder, considering effort Mono applied. Pete Harrison said they "muffed" it, called direction "amateurish" (a slap to Christy Cabanne, but do you suppose he cared? --- he had probably done four or five more pics before Jane Eyre saw projection light). 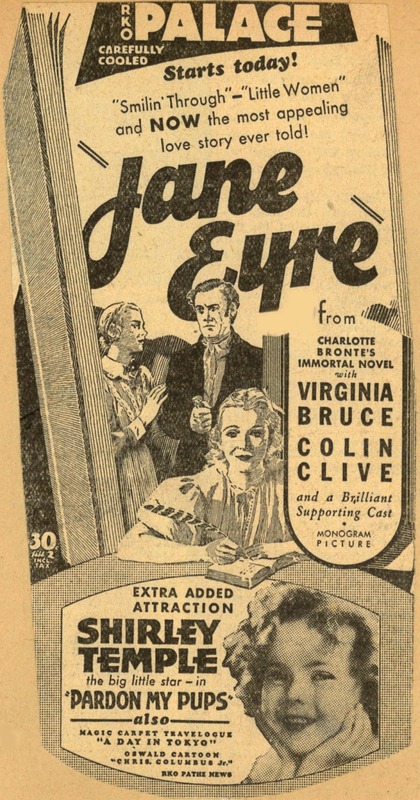 Pete allowed that Jane Eyre was " a safe bet for any exhibitor," especially considering "the present campaign of the churches for clean pictures." Here was where Monogram stood sentry against nasty work too much of youth had been exposed to. Summer release in 1934 came just as a Production Code had its spine strengthened, Eyre endorsed for helping purify soiled screens. 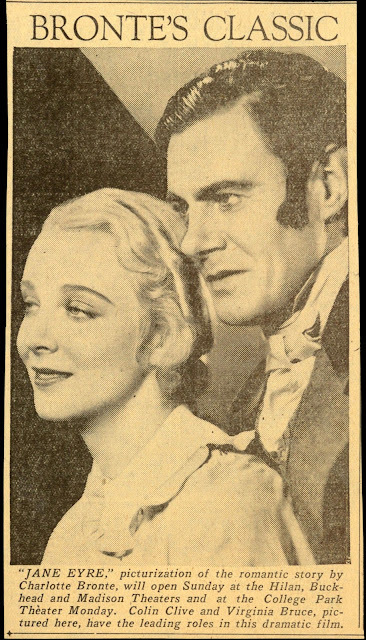 Receipts were good, surprisingly so, in some of keys where Jane Eyre unspooled with co-feature Young and Beautiful, a lively Hollywood backstager for William Haines from Nat Levine's Mascot company (you can see Young and Beautiful on You Tube --- it's very enjoyable). 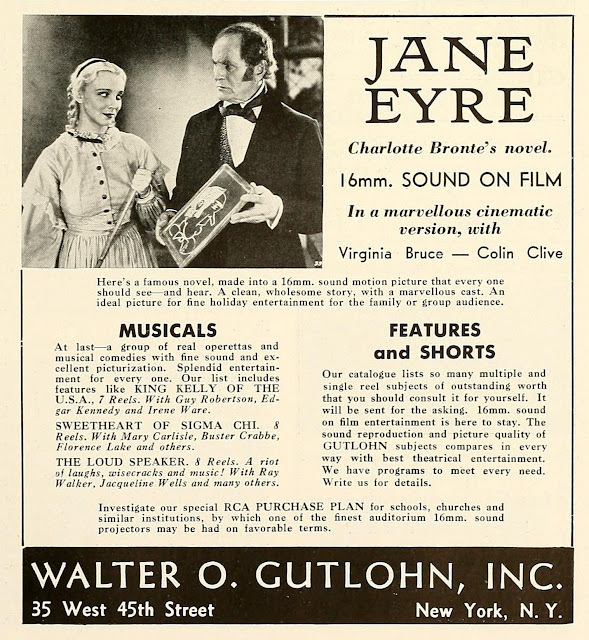 Monogram would not let grass grow under Jane Eyre --- they'd offer 16mm prints for school use by autumn 1935. Trick today, of course, is to find Jane Eyre in a decent presentation. To that rescue comes Sinister Cinema. Their DVD gets it done quality-wise. Thanks, John, for the write-up of the Monogram JANE EYRE. I didn't know Christy Cabanne (pronounced CAB-a-nay) directed it -- I might have guessed Irving Pichel or Howard Bretherton. Cabanne was an old pro who soon found himself being handed projects with low, low budgets. Same thing happened to William Beaudine, Lambert Hillyer, and Harry Fraser, and all of them made every dollar count. Wow, John! Did anyone else offer 16mm prints of features so quickly? Did Monogram do that with other features? This is probably the only way I'd willingly watch any movie version of a Charlotte Bronte novel. Monogram, the always neurotic Colin Clive -- and only 62 minutes long! First-run features weren't released to the 16mm market concurrently with the 35mm releases -- the owners of permanent 35mm moviehouses regarded 16mm as unfair competition. They cried foul when transient 16mm showmen ("jackrabbits") grabbed off their audiences. Reissues were offered simultaneously in 16mm and 35mm. Independent distributors like Astor and Guaranteed were happy to make a few bucks wherever they could. 16mm prints of POT O' GOLD (as JIMMY STEPS OUT) and BEYOND TOMORROW came out alongside the 35mm prints, for example. Columbia got in on this, too -- the 1949 reissue of PENNIES FROM HEAVEN hit the 16mm market at the same time.